Welcome back to ‘The Still Series’! This week we’re looking closer at [Psalm 46:10] in order to draw nearer to the original text. Every now and then, it can serve us well, to read like a Hebrew, (right to left). Perhaps, if we lived our lives a bit more backwards, we would see the truth – straight forward! The backwards approach, it’s the way of the Christian, right? To be great – become a servant, to be honored – be humbled, to find life – lose yours first, to have an abundance – pour out the best of all you have and so on… Okay, now back to the Psalm and studying it – Hebrew style! God: In this Psalm, it is the Hebrew word [Elohiym] or Elohim; meaning the (true) God or God of all gods. He is God in the highest regard and fullest sense of the word. El and Elohim are associated with power in the O.T. I am: The one who is, always was and who is to come. Know: [Yada] To know by experience. To become known, be revealed; to perceive, confess, acknowledge, understand, declare. It’s neat when we dig a bit deeper into Holy scripture. We’re bound to discover, surprising insights and significance even in the simplest of words! And why wouldn’t we; when every Word is God-insprired and God-breathed? In this direction, we first establish God’s name; the representation of who He is. Elohim: all powerful, God of all gods. And it’s in acknowledging Him, His Name, His power and supremacy, that calms our hurried hearts with a stillness and assurance, which no amount of stress can steal. When we ‘Know’, we can ‘Let Go’. Let go of fear and frustrations and fall far into surrender. To know God is to ‘acknowledge’ the knowledge of His Word and take it to heart. Acknowledging Him in all our ways, keeps our hearts (so prone to wander), steady, still and secure. Scriptures like, Philippians 4:8 speak clearly the kind of thoughts we should think upon. They act as a boundary line for the brain; a safe border set up to protect and guard the heart. Repeated meditation of truth is how we cultivate relationship and trust in God. Knowing, trusting and resting, coexist side by side. The better we know the Word, the deeper we trust in His Word. Trust is what guards our hearts from worry, defeat and disbelief. Knowing is how we; forsake fear, abandon worry, let drop what’s distracting and let go of what’s distressing. Amazing conversations are to be had while doing dishes. At least that’s where it happens for me. I pull the baby swing in and repeatedly assure her, “I see you”. She needs the reassurance of my voice, when she can’t quite see my face. It’s the awareness of God’s presence that moves us to be still, even in the midst of commotion and chaos. When responsibilities summon us and urgent demands shout to us; God’s presence provides the peace to go about our schedules and duties, with an undisturbed, unhurried heart. The weight of the world wasn’t meant to be carried on our shoulders. We’re not called to carry our cares, we’re commanded to let go of them. Being still, is more than a few moments spent in solitude. It’s a way of life; a mind-set, a heart-condition. It’s a lifestyle committed to; continually let go, cease from striving and sink deep into surrender. It’s learning to forsake the flesh and pursue the presence of God. Because His presence is what gives us the deep peace we’re desperate for. Again: Be still (in Hebrew); to let go, to let drop, to be quiet. Also: to cease, sink, refrain, forsake, withdraw, abandon. and abandon one self into the power of His presence. Let’s not live this life putting forth exertion toward the flesh, which becomes wasted energy. For whatever we give our strength to, we yield our heart to. Instead, let’s yield it to the things of the Spirit; that which brings life, produces peace and profits the soul. As we continue through this series, we’ll apply this Hebrew translation of be still; to serving, to the burdens and battles we face and to the everyday daily grind. How are we to ‘let go’ and cease from striving, when some seasons feel like your just surviving? Stay in touch as we seek, search and study, The Still Series together. I sooo am going to spend each day reading through the series. Good word, always exciting to dig deeper into His word. 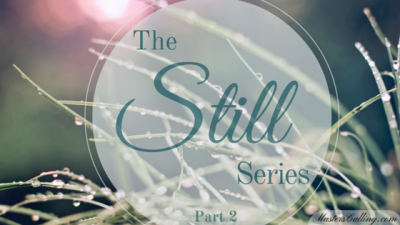 Jessica, I’m reading through the Still Series now…and what an incredible reminder of truth and serenity in Jesus. I love this post… it is so true! Thank you for sharing great insight! Blessings!